Charming stone farmhouse in Tuscany, villa rental which has been recently restored and turned into nice and comfortable apartments. 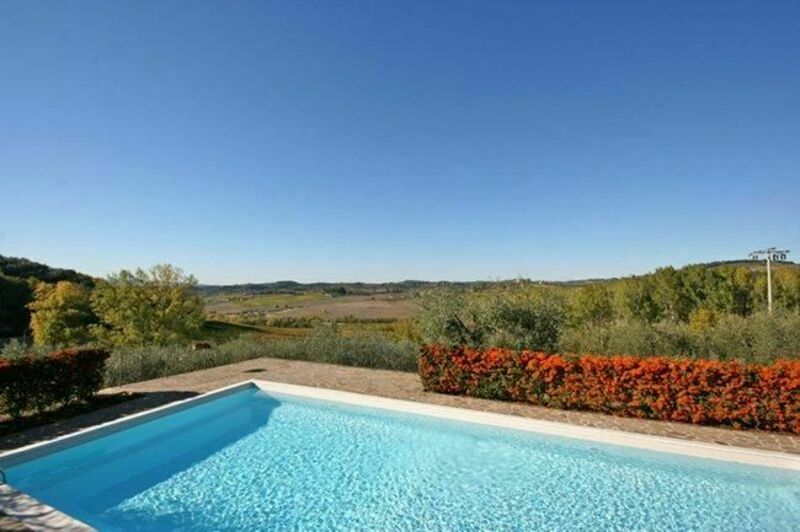 The villa rental is situated on the Chianti hills and affords beautiful views over the surrounding vineyards and olive-groves, typical of Tuscany. Distances: Poggibonsi with all kinds of shops 4 km, Castellina in Chianti 16 km, the medieval town of San Gimignano with its famous towers approx. 14 km, Siena approx. 30 km, Florence 40 km. At guests` disposal: large garden with fruit-trees and olive-groves, shared swimming pool (6 x 12 m - max. depth 1,65 m - open from 1/04 to 31/10) equipped with garden furniture and set in panoramic location, shared barbecue and bread-oven. Small shared laundry. All of the apartments of the villa are provided with a private outdoor area furnished with table and chairs. Parking within the grounds. Ground floor: living-room with dining area and kitchen corner (oven), double bedroom, bathroom with shower.